Ur-Weisse is a very successful doublet act between the freshness of wheat and the heft of dark malt. Amber-colored and cloudy; initially aromatic impressions are of clear aromas of malt; the palate is fruity then dry, while the bitterness is very smooth in the finish. I’m in a bad mood, so this beer better be good. I won’t even begin to try and figure out how to pronounce it, but in the preliminary research I did… I want to go to Germany. If nothing more than the stein filled with beer. If I ever do (and I will) make it to Germany, I will make sure to go during Oktoberfest. They have celebrations here in the states, but there is NO WAY they are the same as those Europeans. Anyway, on with the beer. The nose on this this is HUGE. It smacked me in the face before I could even pour a glass of this stuff. 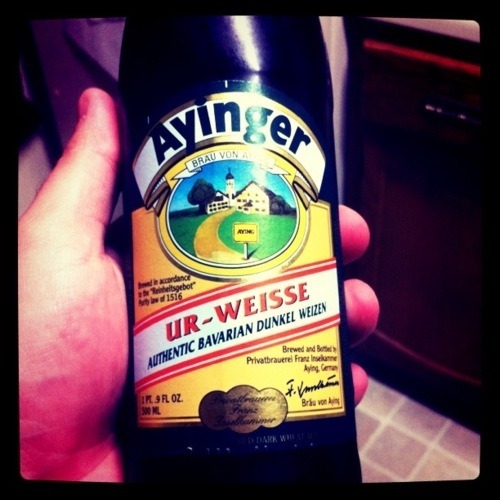 It has a very familiar nose, similar to a Blue Moon or any other wheat beer you might find. But after a sip of this stuff, I will never enjoy a Blue Moon again. There are subtle similarities… but the aftertaste is so much smoother than that of a Blue Moon (and I use Blue Moon as that’s the most popular wheat beer here in the United States.) The ABV is a bit higher than a Blue Moon, but it’s not obvious. The aftertaste is quick, but the smoothness makes up for it. You are hit with hints of spice (a weak spice at that) long after the beer has been swallowed. There is a slight carbonation on the back half of the tongue, but just like the aftertaste it’s quick. The smoothness of this beer makes up for anything else that could go wrong. It’s a lot better than a Blue Moon, and I would totally buy another bottle of this. But I really want to drink this out of a HUGE beer stein. Let’s make that happen this October, shall we? Bottoms up people! This beer pours out really thick, like so thick that it kind of looks like orange juice to me. It has kind of a spicy, citrusy smell to it. Not really a lot of head or carbonation to it. On the first sip, you taste a bit of carbonation. It’s kind of a strong beer. The flavor definitely tastes very citrusy to me. You can tell it’s a wheat, but it’s a very powerful wheat, with extra citrus flavor for sure. The taste… well, it’s actually pretty good. Imagine flavors of honey, cinnamon, and lemon/orange in a beer. I know, it doesn’t sound very good, right? But that’s what it reminds me of, and it’s pretty good together. I would definitely buy this one again.